You can help make your care safer by keeping a list of all your medicines and how you take them. Keep the list with you at all times and show the list to your doctor, nurse, pharmacist or other healthcare professional any time you receive care. This way, your healthcare professional will know what medicines you are taking and how. This can prevent a mistake with your medicines like missing a dose of a medication you need, or getting two medications that shouldn't be taken together. Your list should include all your medicines, even medicine that you buy without a prescription. Any time you begin to take a new medicine, add it to your list. Don't forget things like vitamins, minerals, herbals remedies and medicines you take for pain! Knowledge is the best medicine has developed a free app "MyMedRec" that among other things helps patients keep a record of their medicines and immunizations. This free app is available for use on iPhone, Blackberry, and Android devices. 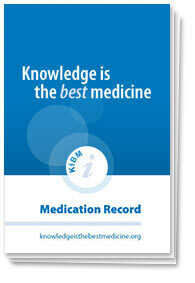 Knowledge is the best medicine also offers a customizable PDF "Medication Record" that can be saved on your devices or printed. Other useful forms and wallet cards that you can use to keep your list of medicines are available from the Manitoba Institute for Patient Safety "It's Safe to Ask" website. Ask your healthcare providers if they offer access to a personal health record which allows you to keep a list of your medicines through a website.